Escape from Wildchild Wood by embarking on a dangerous mission to find a secret code that has laid hidden for many years. You must then abseil down the Tower of Terror, and make your way over the awesome Adventure trail, using your skills to complete a number of challenges as you go. For each challenge you successfully accomplish, you will receive a piece of the missing treasure map. You must put them together and make your way into Wildchild Wood to find the secret code. Should your mission be successful, you and your team must then plot your escape using the exhilarating zipwire to safety! This is an adrenalin-fuelled, fun-packed holiday activity for kids that will get them engaged, active and above all enjoying the thrill of the outdoors. The thrill of adventurous outdoor activities in the woods. Survival skills tested in “Wild Den Building” challenge. Abseiling the Tower of Terror builds self-esteem and confidence. Making teamwork and planning skills fun by completing the adventure trail. Better thinking through solving a secret code before the final excitement of a 70 metres zip-wire. Make friends and gain a sense of achievement through active fun. Safety: All safety equipment provided. Instructors are extremely experienced and do not allow anyone to attempt anything they feel is dangerous. For complete peace of mind Public Limited Liability Insurance is held and all instructors are CRB checked. 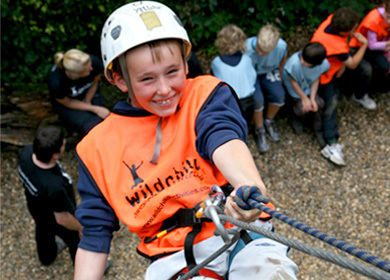 “My child was pouring over with enthusiasm when I collected him, it was the most fun he’s had at any activity day”.